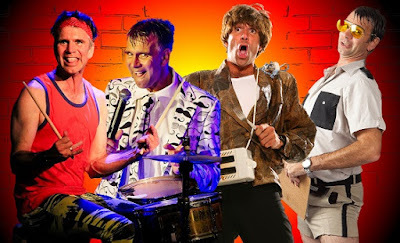 Laughter abounds and the spotlight falls squarely on ‘crazy’ as comedian/drummer Gino Fabbri returns to Durban with his laugh-a-minute comedy Gino Fabbri is Completely Nuts which has two shows at the Suncoast Barnyard Theatre on April 4 and 6, 2019, before moving to the Elizabeth Sneddon Theatre from April 9 to 14, 2019. ‘Sanity’ is not a word very often associated with Fabbri – or more specifically, with the hairbrained completely crazy characters that he portrays: from a self-deceiving Latin Lover and an over-zealous, hip-thrusting excessively rule-bound traffic cop, to a talentless pop-idol wannabe with parental and self-esteem issues, and a wheeler-dealer businessman who battles to prevent his inner monologue from spilling out to an entertainer extraordinaire who is a lot less extraordinary than he thinks. The multi-talented Fabbri, who is also a renowned South African drummer, includes three show-stopping finales in the show, taking his audience on a musical journey through the evolution of the most recognizable rock drum fills before turning classical music on its head like never seen before. Fabbri’s characters share an inability to accurately perceive exactly what is going on around them, all the while trying to compensate for their shortcomings. In doing so, hilarious consequences ensue as he moves from naughty stand-up comedian to quirky singer. There are two shows at the Suncoast Barnyard - April 4 at 20h00 and April 6 at 14h00. Tickets for the Suncoast Barnyard shows are R140 and can be purchased by calling 031 940 0500. The show then moves to the Elizabeth Sneddon Theatre from April 9 to 14 and tickets are available through Computicket.